Advice on large and small scale worm farms and farming. Insight into the economics of worm farming. Practical advice for NGO's and community gardens. Built-in Garden and Trough Worm farms. Advice to horticulturists and tunnel owners on how worm farming can be incorporated into their operation. Vermiculture and the use of earthworms and their products (vermicompost or worm castings and vermileachate or worm wee) has increased markedly in recent years. This is because of the move towards organic farming and vegetable gardening, and the worldwide need to recycle organic waste in an environmentally friendly manner. Vermiculture and the use of worm farms assists home and community gardeners, horticulturists, businesses and farmers to reduce their organic waste to products invaluable in composting and soil fertility. It also diverts waste away from landfill sites, so reducing pollution. Producing vermicompost reduces the need for expensive fertilisers, delivers a cleaner and greener environment and saves money. It generates wealth from waste! As a company Wizzard Worms guarantees the effectiveness of our products and services. We will assist all our clients to save money and increase their crop yields and beautify their gardens. Further the worm wee has been found to inhibit some insects and improve plant resistance to some deseases..
A worm farm is an easy, cheap and efficient mechanism for converting organic waste into liquid feed (worm wee or vermileachate) and rich organic compost (vermicompost), using the natural action of earthworms, and ultimately creating an easy to harvest, marvellously effective 'compost tea'. 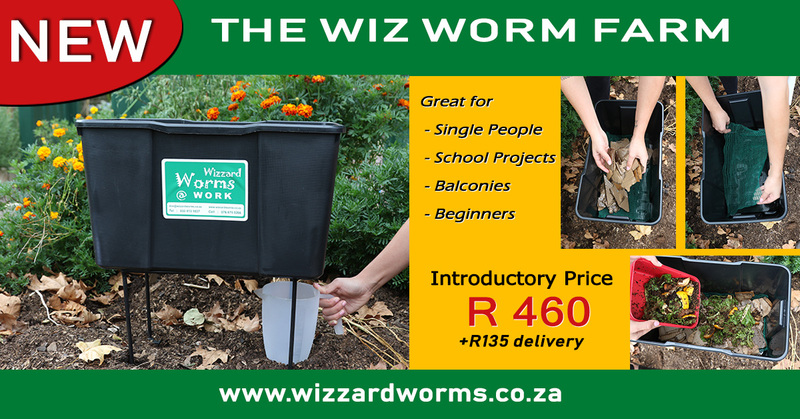 Deals with the uncooked kitchen and garden waste , horse, elephant and cow manure..
Wizzard Worms supplies any quantity of worms that you will need for your worm farm. Our earthworms are bred on the farm and sold and couriered in strong cartons measuring 30 x 10 x 12 cm. We have found the worms comfortably survive up to 7 days in transit. As Durban, Johannesburg and Pretoria shipments are generally delivered within 24hours and Cape Town within 48hours the worms arrive in good condition. Worm Wee is a slang name for the liquid that is produced when worms work on organic matter. Worm Wee contains most of the vital nutrients your plants need for optimal growth. It is an outstanding tonic to feed and revitalise your garden, vegetable patch or farm! Worm casts are the result when compost or organic matter has been digested and worked by worms. Dilute 20 parts water to 1 part Worm Wee and apply (using a sprayer bottle or watering can) around the base of your plants or apply as a foliar feed. Dilute 10 parts water to 1 part Worm Wee and apply around the base of your plants. I would like to thank you for your speedy service. Wonderful. I have all the worms you sent and they are settling in…I have given your number to about 40 people so far, so I hope that you get some great business coming your way.